Wireless is really convenient until you drop your connection or get really low speeds. Thanks to DD-WRT, it’s easier than ever to extend your home networks range with a few simple tweaks and a spare router. DD-WRT is a fully feature-packed alternative firmware for your router. If you don’t know what it is or how to get it on your device, you should start off with Turn Your Home Router into a Super-Powered Router with DD-WRT. 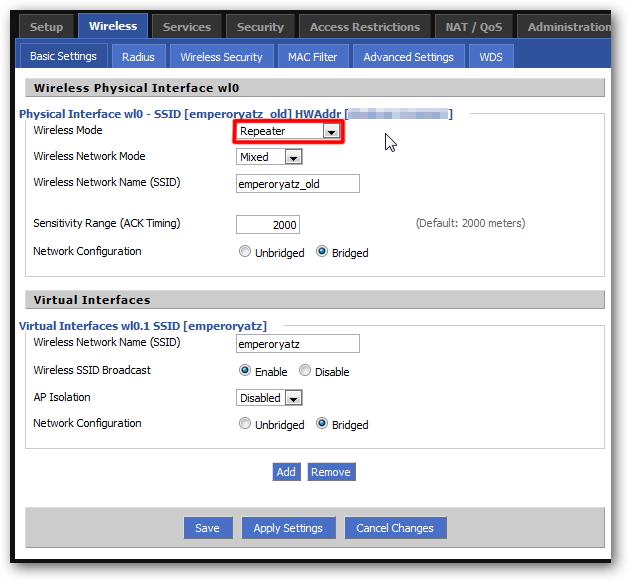 Fire up your web browser and direct it to your router’s configuration page. Go to Wireless > Advanced Settings. There are three settings of interest, the first being TX Power. This is the broadcasting power of your transmitting antenna. The default is a safe value of 70, but we can kick it up a bit. Most people report that jumping up to a 100 is safe. Pushing it higher can cause excessive heat which can damage your router. I don’t have to worry about that since my “server area” is cold and I’m also a bit reckless, so I kicked mine up to 150. It’s been that way for a few weeks and I haven’t had a problem yet, but your mileage may vary. Use your common sense and discretion. Next up is the Afterburner setting. If your wireless router and adapters support Afterburner – also known as SpeedBooster, SuperSpeed, Turbo G, and G Plus (but not Super-G) – you can enable this to get a boost. Things may slow down if they don’t support it, though, so be sure to do your homework. B-only devices won’t see any problems and N-based devices shouldn’t be negatively affected, either. Finally, we get to Bluetooth Coexistence Mode. If you use bluetooth a lot, then you may have noticed a drop in reliability or speed with both wireless and bluetooth devices. Turning this setting on should keep the two from interfering too badly with one another. Most of us have upgraded our networks with new routers over the years. If you have your old one lying around, why not throw DD-WRT on it? I had a spare Linksys wireless access point, but after putting alternate firmware on it, I had a full-blown router on my hands. We can put our spare device to work as a repeater, which can act as a range-extender for a new section of your house or yard. 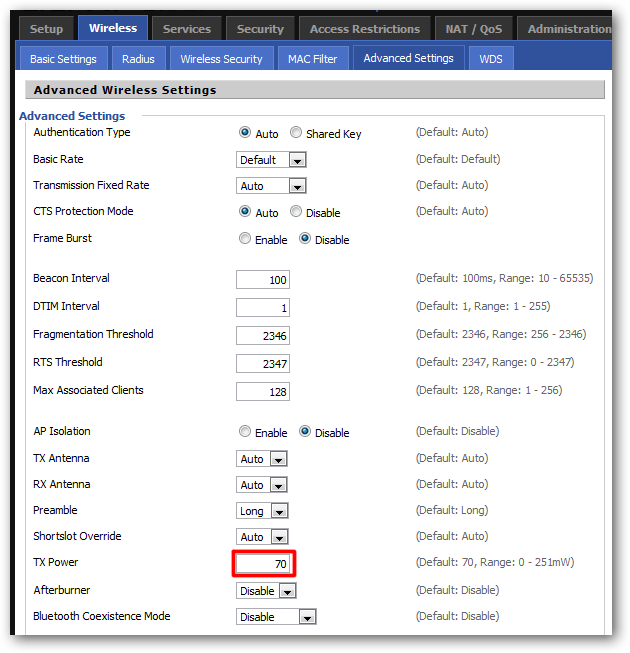 Under Wireless > Basic Settings, change the mode to Repeater. You’ll see two sections, Wireless Physical Interface (wl0), and Virtual Interfaces (wl0.1). The physical interface is going to be receiving the signal from your main router. 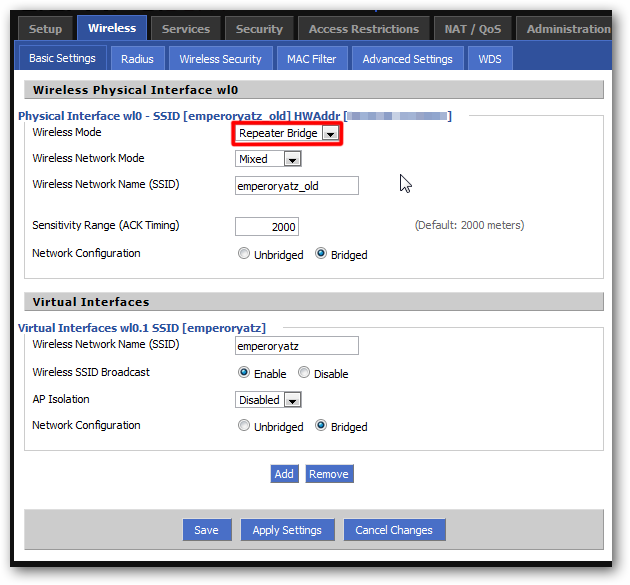 Plug in the SSID, configure the network mode, and decide if you wanted it to be bridged (connected with the old network) or unbridged (isolated from it). Next, come up with a new SSID for your repeater. This way, you can choose which access point to use, depending on where you are. Click on save, then go over to the Wireless Security page. 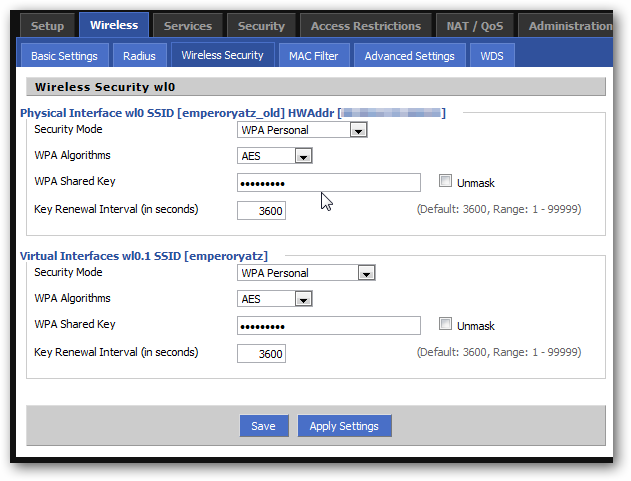 Enter the wireless security settings for your main router, then enter the details for your new repeater’s signal. Lastly, we need to make sure that your repeater is connected to your main router. To do that, go to Status > Wireless. At the bottom of the page, you’ll see a button that says Site Survey. Click on it. 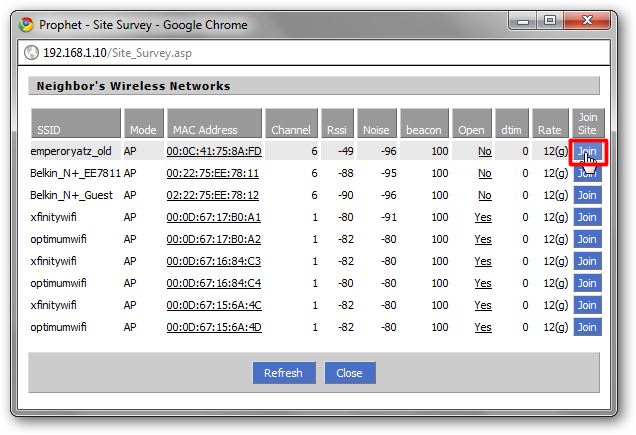 Find you main router’s wireless SSID and click Join. That’s it! Place your repeater on the other side of your house, but not so far that it doesn’t get a good signal. Then, you can connect to your new repeater and test it out. 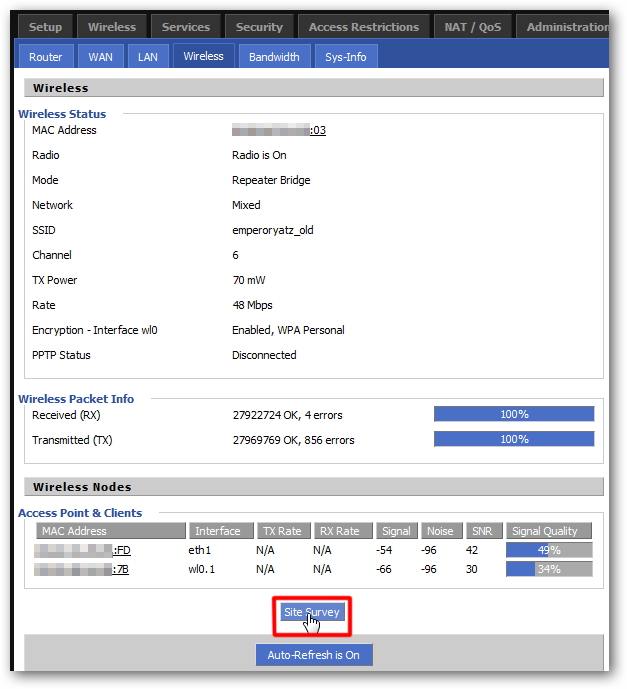 An added benefit of DD-WRT is that you can configure your repeater to act as a wireless receiver for a computer that doesn’t have one. Return to where you configured the repeating function, under Wireless > Basic Settings. Change the mode to Repeater Bridge. Now, you can plug in a device into the router’s ethernet ports and it’ll act just like it’s wired into your main router. If you’re not using it then you should turn if off, as it can cut your bandwidth otherwise. If you’re looking to speed up browsing, Removing Advertisements with Pixelserv and Find a Faster DNS Server with Namebench can both help your cause – with or without extended ranges – thanks to DD-WRT.